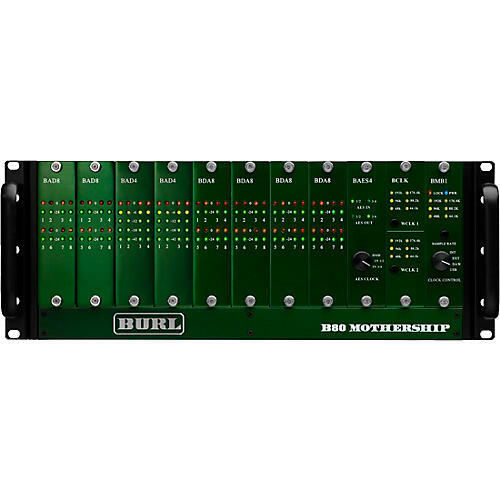 The Burl B80 Mothership is the ultimate AD/DA converter, with the capability of converting up to 80 channels of audio with the right configuration of interchangeable cards. Using a card based system, and a heavy duty 4U chassis, the B80 Mothership employs 10 card slots with 2, 4 and 8 channel AD/DA cards, all with the B2 quality signal path. Every ADC channel has a BX1 transformer and every DAC channel has the latest Burl Audio discrete op-amp, BOPA2, technology. With a completely configurable AD/DA, a converter for any situation can be realized. If you just mix, load up the B80 with 8 BDA8 cards for 64 channels of mind-blowing fidelity. If you track live, 6 BAD4 cards will give you 24 B2 quality inputs, and 4 BDA8 cards gives you 32 channels of outputs. Rocking!Digital interconnect is also completely configurable, and controlled by a swappable motherboard. The first offering of the B80 digital motherboard, the BMB1, comes standard with two Digi-link connectors for direct hookup to Pro Tools. Burl Audio does away with the expansion port, making both primary ports. That means you can play 64 DAC channels straight out of Pro Tools with one unit! No more cascading units with multiple word clocks. All channels can run off of one internal master clock. Of course if you do need more channels, multiple units run flawlessly with tight clocking. The technology that makes this possible is the Burl BackBone. The Burl BackBone is a high bandwidth backplane delivering incredible digital audio throughput. The Burl BackBone also delivers large amounts of power to the analog sections. Master clock travels directly to each converter eliminating the need for individual PLLs. For complete control of all of the B80 signal routing, and stand-alone metering, a USB port has been included. This is not an audio interface it' strictly for control. A future touch screen control will plug in here. The flexibility of the B80 design allows for a smooth integration and upgrade path. Burl Audio' intention with the B80 is to create one main chassis that takes care of virtually any music, broadcast or film recording situation.